When I reached the top of the cathedrals in Chartres and Strasbourg, gorgeous, expansive views awaited. But in each place, it wasn’t just the long distance vision that greeted me, but deeper revelations which wouldn’t have been so clear from the ground. 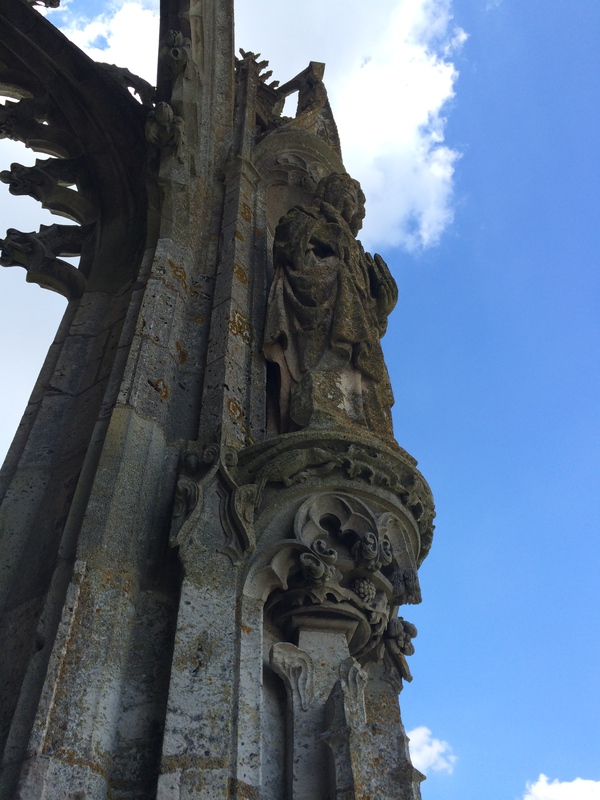 In Chartres, there were life-sized statues, intricate gargoyles, and mischievous little creatures crawling (in stone) all over the upper reaches of the Gothic spire. What good did they do up there, completely hidden from the ground? Even in the cathedral’s heyday, how many people scaled the tower and once up top, noticed the intricate stonework? They were made and fitted up there because the stone workers knew that God could always see their work; their efforts were for God’s glory and God’s delight–not primarily for fellow humans to enjoy. At Strasbourg, going up to the spire landing allowed a view of the surrounding mountains, land where my ancestral family had lived for years before immigrating to the US in the mid-1800s. Seeing the land that is, in a way, in my bones and my being helped me understand why I’d so fallen in love with the Blue Ridge mountains back home in North Carolina–where I’ve come from, and maybe a bit of who I am. This entry was posted in beauty, spirit and tagged faith by Emily. Bookmark the permalink.